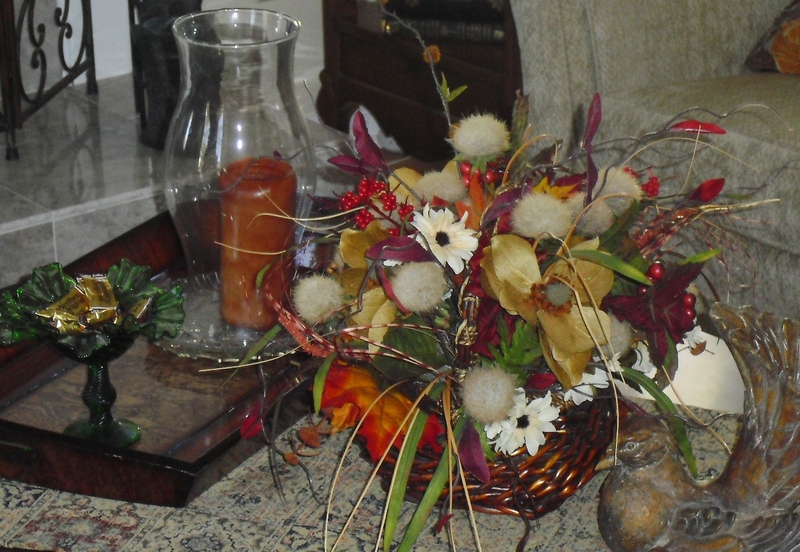 THERE WAS ALWAYS ONE DAY IN EARLY SEPTEMBER when my Mother would say, “fall is in the air” – and we would set out looking for bittersweet, cattails, wheat stalks and other interesting dried weeds and seeds to make into her Fall decorations. We knew fall had officially arrived, when we smelled her first loaf of pumpkin bread in the oven. I LOOK FOR SIGNS OF FALL, as I take a break on the screen porch, with a second cup of coffee and an English muffin smeared with cream cheese and tomato marmalade. We are in the North Carolina mountains this week enjoying the cool air and gentle breezes. THE MOUNTAINS are blanketed with trees stretching to the sky, their leaves mostly deep green now at summer’s end. The trees in our woods appear stately and still – as if their sturdy trunks, and all their leaves, are holding their breath – just before they exhale in a fall explosion of color. Fluffy clouds in the sky lay shadows here and there across the mountains in dark stripes, alternating with the sunlit areas, making the mountain range look like a giant head of just harvested broccoli or a boiled wool jacket in textured stripes of sunlit green and olive-black. IT’S EASY TO IDENTIFY Mt. 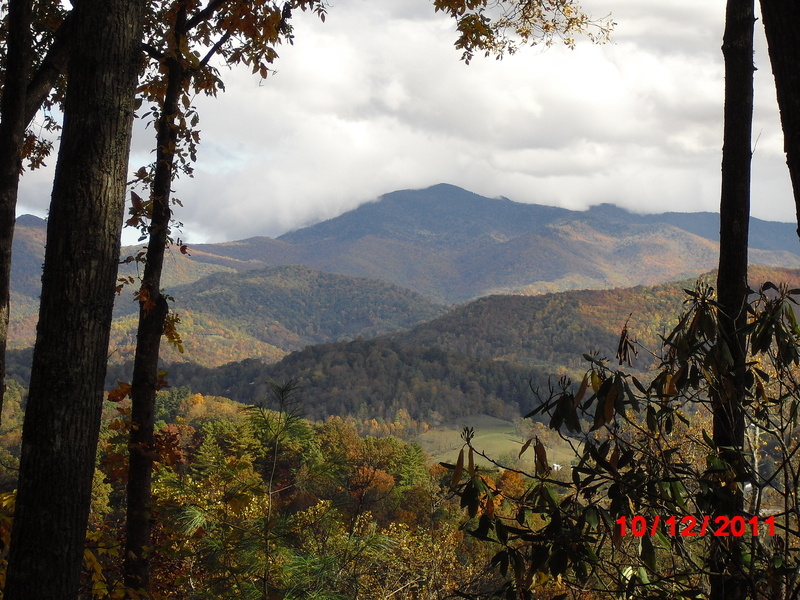 Mitchell, elevation 6,684 feet (ncparks.gov/visit/momi/main.phb), the tallest mountain east of the Mississippi. The climate at the peak is more like Canada then North Carolina, with animals and flora more alpine in nature. Some birds that make their homes on the highest peak do not fly south for the winter, but fly down the mountain to a more suitable climate for wintering. THE LEAVES ON THE DOGWOOD trees are beginning to turn red and berries are appearing on the branches. So far, only a few trees show evidence of changing colors. Red shows here and there through the woods. Dry leaves are scattered on paths. An occasional yellow leaf tumbles to the ground from high in the canopy. I HEAR THE RAT-A-TAT of a woodpecker, and finally locate his red head pecking like a jackhammer, on a tree not far from the porch. The squirrels chase each other up and down the trees, stopping to gather nuts and seeds for their winter stash. 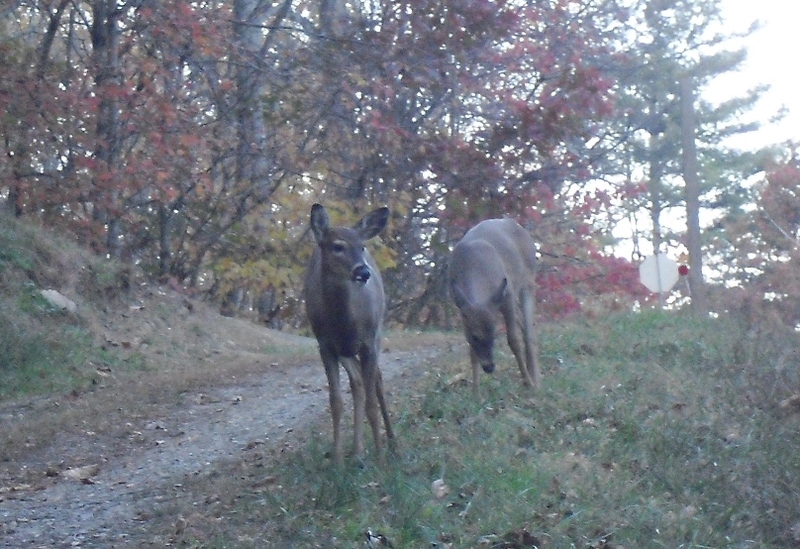 A doe and two young deer appeared in the back yard again early this morning as we were making our coffee. The fawn have grown and lost their baby spots. They scamper and nuzzle each other like the adolescents they are. THIS AFTERNOON WE SEE WILD TURKEYS emerging from the woods. They are in a rowed flock of 15, playing follow the leader, as they climb up the steep mountainside, in an ascending column of feathers and bobbing blue heads. Blue heads? That was a surprise to me too. Blue as the Carolina sky! I always thought wild turkeys were skinny birds, not fat like the turkeys fattened for our thanksgiving tables. Not so these birds. They look fat to me. A FEW LONE HUMMINGBIRDS ARE busy stuffing their tiny bodies with nutrients in preparation for the long trip south. My herb garden is getting leggy, as are our the geraniums and petunias. I pick the last of the tomatoes. I button my sweater against the cool afternoon. Maybe we’ll build our first fire of the fall season tonight. I make a mental note to arrange for a cord of wood to be delivered. 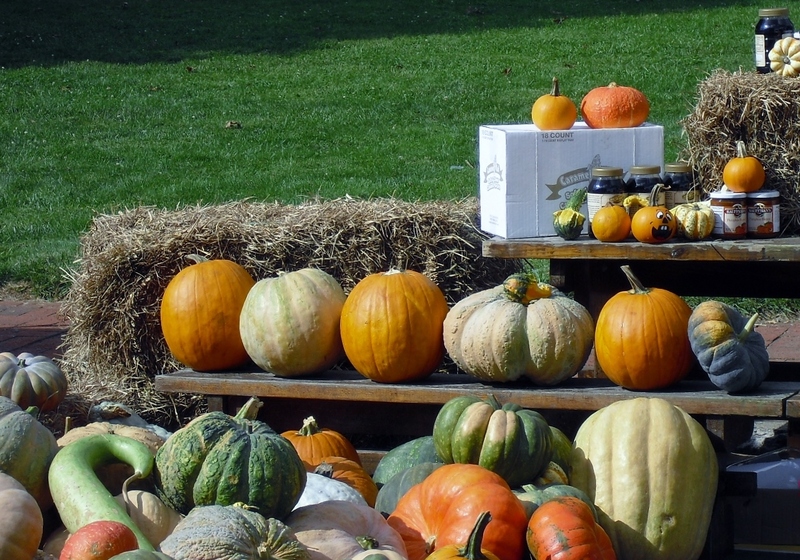 TODAY’S MAIL BRINGS notices about Fall festivals in the small towns throughout the North Carolina mountains – each one with a unique history – Brushy Mountain Apple Festival, Old Timey Days, Mt Mitchell Festival, Tomato Festival or Wooly Worm Festival. Children love the wooly worm races. Some old timers vow the thickness of the wooly worm’s coat predicts the kind of winter we will have. All the festivals have music,fresh produce, prepared food and beautiful mountain crafts. North Carolina is now 10th in grape production and wine stompings are more common. AT TWILIGHT, I see the lights in the high school stadium in the valley below. Football season is underway at Mountain Heritage High School. I decide that tomorrow I will bring in pots of rust, orange, red and yellow mums to brighten the house and porch. I’ll set some pumpkins and bittersweet on the screened porch and decorate the dining table and mantle with colorful leaves and pumpkins. It’s time to put away warm weather clothes and get out sweaters, jackets, corduroy, wool and hats. A good night for chili and apple pan dowdy. A NEW SEASON. My mother used to say that “each turning of a new season gives a person a lift.” I understand what she meant because I feel the same way. As a new season approaches, I feel emotionally uplifted, eager for new experiences and motivated to action. Time to make my action list for Fall. What are the SIGNS OF FALL you look for? What MEMORIES ARE STIRRED when they appear? My five senses come alive in early fall. Each sense is tagged to a memory-a good memory, of a wonderful time in this little girl’s life. I wake up; my feet hit the floor and I feel a bit of a chill that has not been present for the past six months. Fall is in the air. I put on my snuggly bunny slippers and quietly make my way down the semi-dark hall to the kitchen, taking care not to awaken anyone else. The sun is not yet fully awake, and fall is in the air. One of my favorite parts of the day has begun. I peek around the corner to the big wooden chair pulled up to the kitchen table. There sits my Dad, pretending not to notice that I have entered the room. My nose is been teased with all kinds of familiar scents, ranging from the woven rattan chair bottom to the freshly printed newspaper and of course, the smell of hot coffee, warming on the back of the stove for my mom, who will rise and begin her day approximately 2 hours later. The oven door is slightly open, spilling scents of Mom’s homemade apple bread, and fall is in the air. As I climb up Dad’s legs to take my usual place in his lap, he supports me with one hand, shielding me from accidentally knocking over his coffee mug, while holding a black number two lead mechanical pencil in the other hand. The New York Times crossword puzzle is almost complete. Soon after I begin my incessant round of morning conversation, Dad puts a finger over his lips, motioning for me to be quiet and listen. The typical dawn chorus provided by the robins, wrens and whippoorwills has begun, but this particular Sunday, a new sound is heard permeating the sounds of Mother Nature, and fall is in the air. Squirrels are busy chattering as they scamper around the back yard, cracking the nuts that have begun dropping from the massive pecan trees hanging over our patio. Walking barefooted is not advised at this time of year, as the bricks are now covered with tiny cracked pieces of pecan shells, and fall is in the air. As we stand outside we can feel a crispness in the early morning air. Our horses are gayly frolicking up and down the pasture, stretching their necks out to take in the cool nip in the air and the smell of the dewy morning, and fall is in the air. Some days, something in the air takes me back to childhood memories too. Thanks for sharing your thoughts of Fall.